Hungarian author and journalist; born at Erlau in 1863. After attending the schools of that city he devoted himself entirely to literature. From 1888 to 1890 he was editor of the "Erdélyi Hiradó," published at Klausenburg, and was also connected with the "Erdélyi Képes Ujság" and the political daily "Magyarság." Since 1890 he has been a member of the "Magyar Hirlap," and since 1882 a prolific contributor of articles, feuilletons, stories, and novels to the leading literary publications of Hungary. In his works he depicts the dark side of life, and is a disciple of the modern French realistic school. 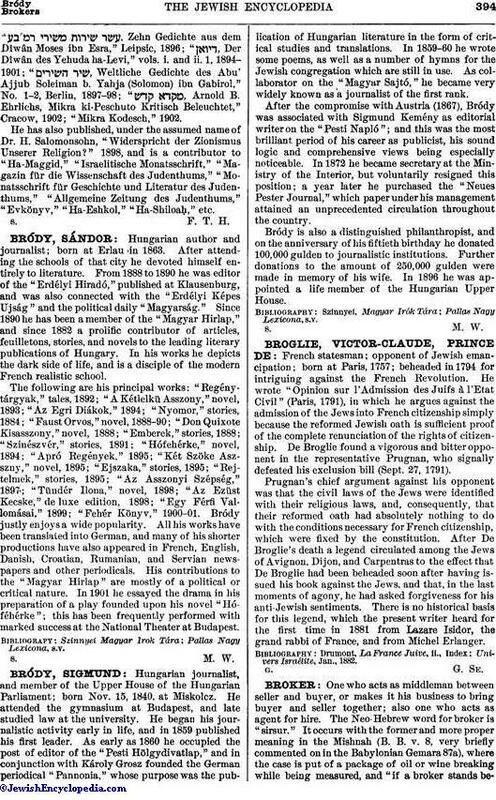 The following are his principal works: "Regénytárgyak," tales, 1892; "A Kétlelkü Asszony," novel, 1893; "Az Egri Diákok," 1894; "Nyomor," stories, 1884; "Faust Orvos," novel, 1888-90; "Don Quixote Kisasszony," novel, 1888; "Emberek," stories, 1888; "Szinészvér," stories, 1891; "Hófehérke," novel, 1894; "Apró Regények," 1895; "Két Szöke Aszszny," novel, 1895; "Ejszaka," stories, 1895; "Rejtelmek," stories, 1895; "Az Asszonyi Szépség," 1897; "Tündér Ilona," novel, 1898; "Az Ezüst Kecske," de luxe edition, 1898; "Egy Férfi Vallomásai," 1899; "Fehér Könyv," 1900-01. Bródy justly enjoys a wide popularity. All his works have been translated into German, and many of his shorter productions have also appeared in French, English, Danish, Croatian, Rumanian, and Servian newspapers and other periodicals. His contributions to the "Magyar Hirlap" are mostly of a political or critical nature. In 1901 he essayed the drama in his preparation of a play founded upon his novel "Hóféhérke"; this has been frequently performed with marked success at the National Theater at Budapest. Szinnyei Magyar Irok Tára; Pallas Nagy Lexicona, s.v.